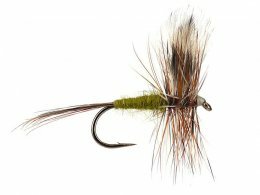 In this category you will find a selection of over 70 classic and traditional dry flies, like the eminent Blue Dun, Olive Dun, Mosquito or the Red Tag. These flies are classic patterns of dry flies and have been approved worldwide over decades. Most of them are tied with traditional natural materials, but have lost none of their original ability to catch. They are rather imitations of insects, mostly may flies or sheer fantasy patterns that are able to catch (as for example the Royal Coachman). If you, in contrast, prefer fishing with classic fly patterns, whose ability to catch has been improved by the use of modern synthetic materials, we recommend you our realistic may flies of foam and the our complete fly assortment of our premium brand hotfly superb.